is a great way to try what I call "designing on the fly". This is what I learned over the last two days of taking a class with Pippa Moore. Our guild hosted the class and it was quite an adventure. 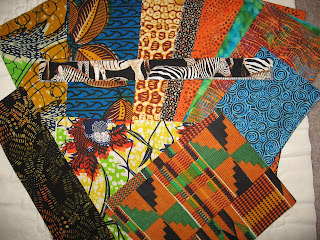 I used fabrics that were unfamilar to me, but the vibrancy of them had a certain appeal. Here is what I had to work with. 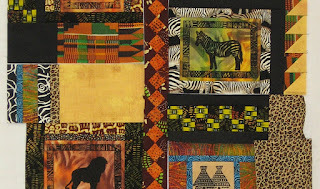 Yes, the kit supplied by Pippa for the class was a cornucopia of African fabrics and batiks. Initially I was uncertain that I was going to be able to put all of these together. My western sense of order was going to be put to the test. However it was Pippa to the rescue with her encouragement and a few consultations. I grasped my rotary cutter and made a start. Here is what I have so far. A special thank you to Pippa. Her easy going manner and ability to draw me into a playful frame of mind kept me enthralled. These two days went by all too quickly despite the extra hour we gained by setting the clock back. The pieces are now on my design wall and I continue to play. Stay tuned for the final result. It was an incredibly fun weekend! I just love seeing all the different collages that everyone came up with, and I can't wait to see your's finished! Lovely! I could see that being done as a 'photo' display. Wow, what a mix of fabrics - glad it was you and not me!! But I love what you have so far. I love African prints and I really like what you have done. There is so much energy in the colors and design...right up my alley.